It looks like a normal, mid-‘80s Buick Regal on the outside, but under the hood and inside, a Toyota fan did something deeply, maniacally absurd. And perhaps ingenious. Okay, so it’s not the big-dog “2JZ-GTE” that everyone wants, but the power and the 220 lb-ft of torque out of the GE are still impressive, as is the engine’s reputation for durability (though the naturally aspirated 3.8-liters in these Regals were unkillable as well, though they better be, since they only made roughly 110 horsepower in 1984). Plus, it’s a 2JZ! That means it’s got great mod-potential, even if not quite at the same level as its turbocharged sibling. Not to mention, perhaps just as good as the engine swap is that whatever three or four-speed Turbo-Hydramatic slushbox was in there has been ditched for a modern-ish five-speed automatic. More gears isn’t always better, but in this case, I’m comfortable saying it is. “I have so many questions. I’m so confused...” writes Jalopnik reader eptoday. This is the correct reaction to seeing the image above, because which kind of loon/genius thought that a 1999 Lexus GS300 dash would even fit in a 1984 Buick Regal? Windshield and instrument panel shape and size vary enormously from vehicle to vehicle. So the fact that the dash fit at all is either a) a total miracle or b) the work of a wrenching visionary. To be honest, I’m leaning towards the second option. I called up the seller, David, to see if I could absorb some of his wrenching brilliance over the phone, but sadly, he told me it wasn’t he who conducted this not-yet-finished work of art. The seller told me he took the Regal on a trade from a Toyota fan. Speaking of this Toyota fan, he said: “He’s a Toyota Supra guy, so he wanted the 2JZ motor in it. “It’s one of them things that, if somebody had the time to finish it all out...it would actually be a pretty slick little ride,” he went on. David told me he’s driven the car around the block, but admits that the machine needs some sort of adapter to get the speedometer working, the exhaust needs to be hooked up, and a few other things need to be taken care of before the project is complete. 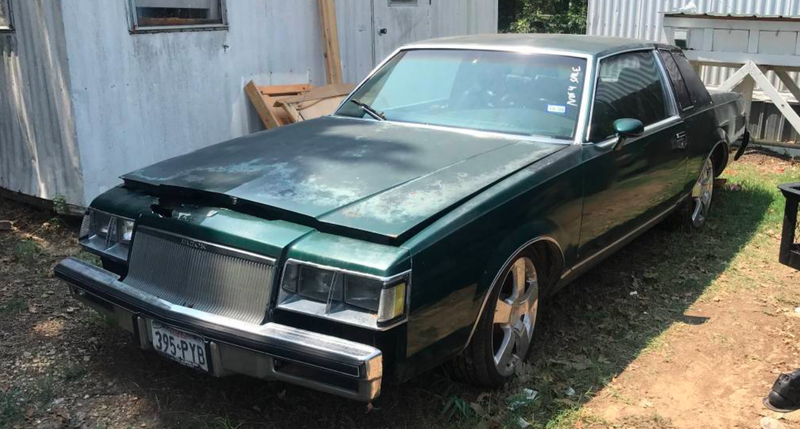 Selling the thing has apparently been a chore, so David is considering ripping out the motor and selling that on its own, which would be a damn shame, because I can say with confidence that this is the only 2JZ and GS300 interior-swapped 1984 Buick Regal on earth. This world would be lucky to have such a machine gracing its streets.